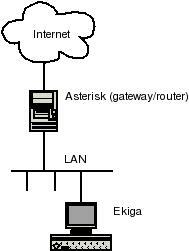 The setup I will use in tese notes is this: Asterisk is installed on the gateway/router to the Internet and Ekiga is installed on an 'inside' workstation. Tip: It is very feasable to have Asterisk and Ekiga on the same host. I will still assume that Asterisk is connected directly to the Internet. Since Ekiga and Asterisk both use the same SIP port (5060) you will have to move Ekiga to another port, e.g. 5061. I will later show what has to be done on Asterisk in this situation. The 3 vs will give you eneough output from Asterisk to let you follow what is going on. After each change to e.g. sip.conf you can execute a 'sip reload' at the console. Likewise, after each change to extensions.conf excute a 'extensions reload'. Use the TAB key for keyword completion. The first exten makes it possible for you to call yourself. Since Ekiga is not a multi-line phone you cannot use this feature with Ekiga but other phones e.g. X-lite has this facility. Instead you can call 600 and be taken through the same echo test as you hear on 500@ekiga.net. Tip: If you have several host on a home network, you can add each of them as clients to Asterisk. You can give them extension numbers 102, 103 etc. For Asterisk you add a section in sip.conf for each extension, e.g. by copy-and-paste from the 101-section (don't forget to change extension number and possibly password!) It is even simpler in extensions.conf: Just add a line such as ”exten => 102,1,Dial(SIP/102)” for each host. This setup allows all the local extensions to call each other. to the [general] section in sip.conf. Note that Asterisk handles video in 'pass-thru' mode and does not do codec translation for video (as contrasted to audio), so the codecs must be compatible end-to-end. This means that you only will be able to use video with friends that use SIP phones which use the H.261 video codec. For a list of such softphones, see this page .